The HERGETH name is known for its long tradition of innovative solutions for the nonwovens industry. In keeping with that tradition, the new HERGETH carding unit offers many new and unique advantages in efficiency, operation, web forming and maintenance. 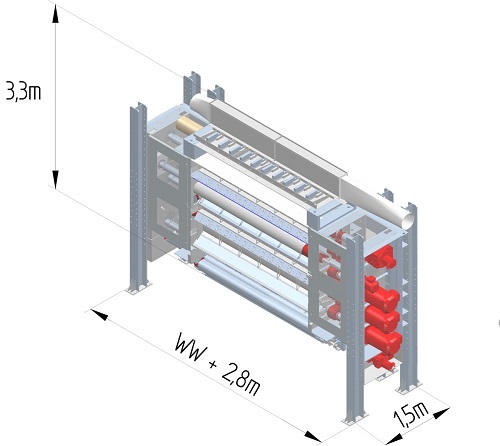 The process starts with our new fine opening unit with mechanical doffing that allows the feeding to the card with very low air volume and produces very finely opened fibres. 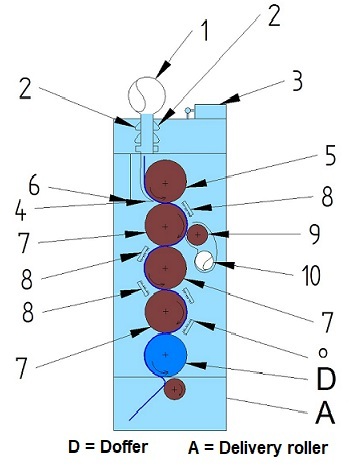 A circular feed line (1) ensures that the fibres are well distributed in the chute feed. In the chute, the fibres are separated from the air by progressively profiled blade bars (2). This profile reduces the risk of fibres intertwining around the bars and blocking the system. The chute is made of segments that set the chute feed depth by electronic linear units (3). 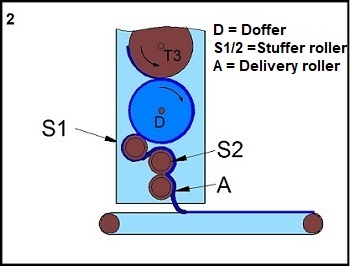 The fibres leave the chute feed and are pressed to the feed roll by a segmented pre-stressed adjustable feed plate (4). This ensures good control of the fibres also on very wide cards. The deflection of the segments is measured to measure the fibre distribution. A PID regulator controls the linear units that position the segments of the chute to achieve a uniform weight across the width of the web. The fibres enter the card through a large diameter feed roll with unidirectional feed (5). The feed table (6) is very large and strong. A large diameter ensures better control of the fibres entering the unit. The three main cylinders (7) have the same diameter as the roll. The use of three cylinders ensures that the fibres are accelerated gently to their optimum surface speed and draft. 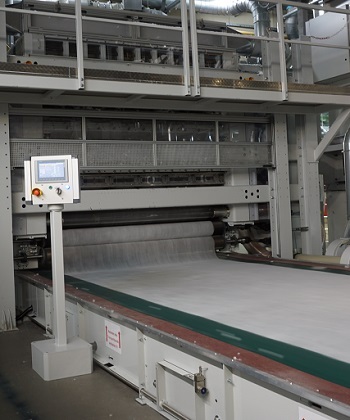 The carding is done by up to fifteen carding strips (8) producing a carding power that is equivalent to a conventional card equipped with fifteen rollers and strippers. The carding strips are easily exchanged and moderately priced. 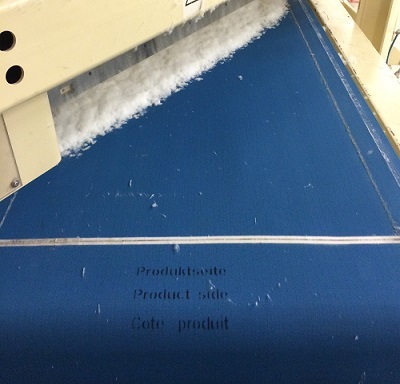 The carding strips can be adapted to the material processed. The strips can be replaced with blanks when less carding power is required. 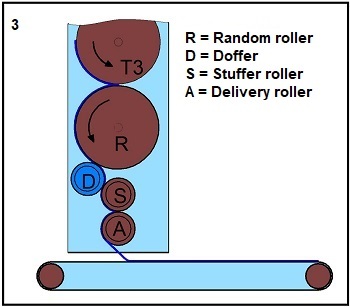 A unique new feature is the 2H roller (9). This roller skims the surplus fibres from the first cylinder. The surplus fibres are suctioned off (10) and reintroduced to the feeding machine thus reducing the chances of thick spots and clouds. The carding feed and carding unit are always the same for all applications. The system is processing fibres from 10 - 100 mm length and fibres from 0,9 dtex up to 100 dtex and coarse wool, and bleached cotton. The LiRa card combines the regularity of roller-doffed carding with the random effect of aerodynamical carding to produce light weight regular isotropic webs. Linear webs or heavy weight aerodynamic webs are also possible within only a few minutes required to change over. 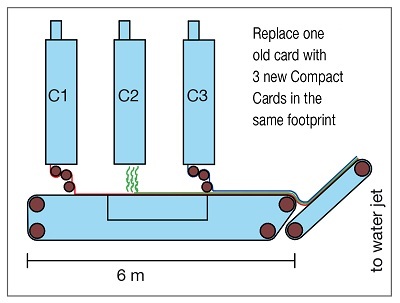 The design of the compact card had the future markets in mind. Minimum space is required for a compact line for 3 fibres with 2 roller-doffed and one airlaid layer: The standard in hygienic products today. 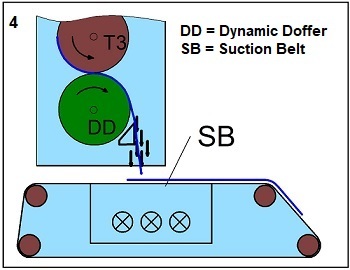 A new way to produce 1:1 oriented webs is to use two aerodynamically doffed carding units that are oriented in + 45° and - 45° with respect to the main transport belt. This method allows for the creation of a single web out of two layers that are oriented at an angle of 90° with respect to each other. 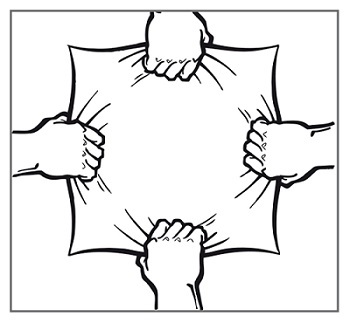 This unique process allows for the creation of new nonwoven products. A machine with one cylinder and no carding elements, but with a stripping roller, is used for coarse products. This machine, with double-sided suction, can also form very heavy webs. Simple operation and low maintenance were the main reasons for creating the new card. Spare part costs are low since only two roll diameters are used. The rolls may be easily taken out, with the bearings on their shafts, to allow for rapid product changeover or for quick servicing. All roll drives are concentrated in a drive tower separate from the carding unit. The rolls are directly driven with cardan shafts thus avoiding belts, chains, and hidden motors in the machine. The shafts are not affected by rotational loads. All motors are easily accessible. 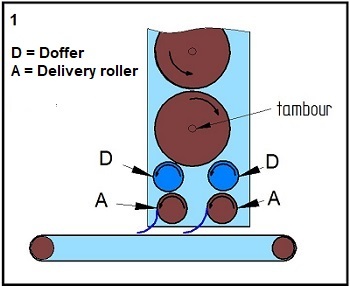 Feed, doffer, delivery rollers, and the stuffer roller, if used, are all servo-driven. The three carding rolls and the stripping roller, if used, are frequency-controlled for instantaneous speed changes. All drives are SEW and the PLC is a Siemens S7 type. The vertical arrangement of the card allows for easy access of rollers and carding elements. 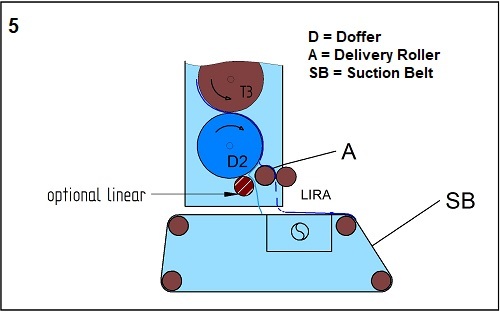 The setting of the rollers is done in only one direction and the setting of the carding elements can be controlled along the width of the carding cylinders. 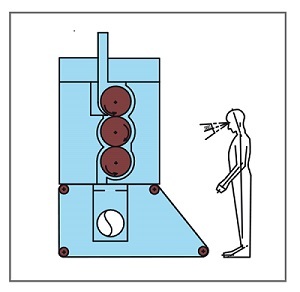 Air flow in the machine is top-down which reduces fibre accumulation. All carding cylinders and the feed roll are fully shrouded. Ample windows allow to view the cylinders even in applications with limited space. No sub-frame is necessary as the machine is bolted to pillars. The card may easily be integrated into an existing production line. Copyright © 2016 HERGETH GmbH. All rights reserved.